Various researchers have demonstrated that leg length discrepancy beyond ¼ inch or 0.64cm can predispose your patients to injuries in the foot, knee, hip and spine. It is common to observe that the long leg side will show signs of degenerative joint disease. It is extremely important to discern whether the leg discrepancy is functional or structural or maybe a combination of both. The treatment for functional vs. structural short leg syndrome is different. The functional short leg syndrome is caused by excessive asymmetrical pronation or supination of the feet, soft tissue contraction in the pelvis/spine, and displacement or subluxation of the pelvis and the spine. To help differentiate between the functional and structural short leg syndromes there are various techniques to be used. easiest of the techniques is to place the patient in a supine position and measure the distance between the ASIS to the medial malleolus. The most common problem with this method is that the pressure from the table can distort the measurement result. Asymmetrical femoral neck angles is a common cause for structural leg discrepancy. 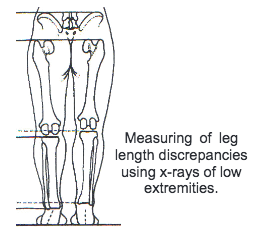 Also fractures of the femur, tibia or ankle is another common cause of structural leg length discrepancy. Another method involves standing the patient and x-raying the femurs,tibias, and the ankle mortise and measuring the length of each bone.The problem with this is that the patient may object to taking too many x-rays and also the time that takes the Doctor to evaluate the results. We at Accuthotix™ are recommending that you use the last method, which involves x-raying the patient in a standing position with the central ray passing through the femoral heads. Of course it is essential to make sure that your floor is level. This split view of the pelvis and lumbar spine is used to measure the heights of the femoral heads. If the femoral head heights differ more than 5mm and the spine deviates towards the short leg side, then a heel lift is recommended. The size of the heel lift should begin at 33% of the femoral head height difference. The Doctor can decide whether to use heel lifts, or to have the orthotics fabricated with a heel lift. Children should not have the heel lift fabricated to the orthotic because they may grow out of the short leg syndrome. It is important to note that adding 33% of the measured discrepancy may not fully correct the pelvic tilt and deviation of the spine. The reason for this is because the talus is positioned 1/3 of the way between the calcaneus in the metatarsal heads, a heel lift placed beneath the calcaneus will raise the talus only 2/3rd’s of that distance. Future x-ray evaluations with the heel lift, will determine whether to increase the heel lift. 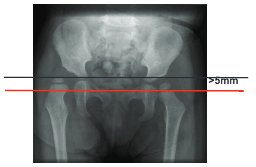 For example, if you post x-ray the patient six months later and the x-rays indicates a considerable pelvic tilt and spinal shift, then add an additional 33% to the heel lift, and evaluate in another six months. It is not recommended to use more than 9mm of heel lift within the shoe. Heel lift therapy greater than 9mm requires an accommodation added to the heel of the shoe. A contraindication to using a heel lifts occurs when the lumbar spine is not deviated towards the structurally short leg side or when there is a functional short leg. Using a heel lift in these situations will cause injury to the lumbosacral spine and a unilateral weakness in the lower extremities. If there is any confusion regarding heel lift therapy, please call us at Accuthotix™ and ask for: Dr. Joseph J. Frasco at (908) 771-7444.